Udon noodles, as you probably know, are Japanese-style wheat noodles. On the surface, they seem a lot like Italian pasta, and the two are more similar than different (both are wheat-based noodles). The main difference is that udon are made with a different type of wheat that results in a softer, more “plump” texture when cooked. You would traditionally serve udon in a full soup broth, but I didn’t like the idea of doing that with this recipe. Instead, I used just a little bit of vegetable broth kicked up with sesame oil, garlic, and soy sauce as a final step of cooking so that the flavor is absorbed right into the noodles to create what you see here ? 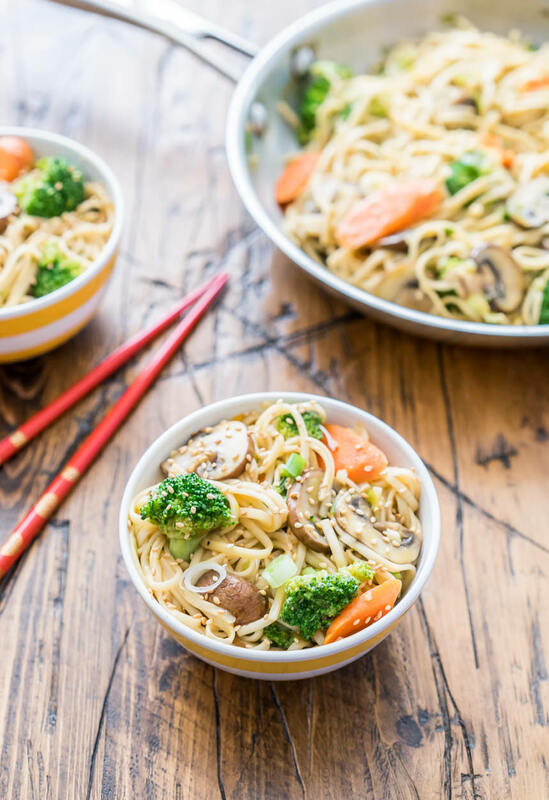 flavorful noodles with lots of fresh stir-fried veggies and a garnish of sesame seeds. It’s an awesome 15-minute meal. Note: It’s a good idea to gather and measure all the ingredients for this recipe before starting because timing is critical around step three when you drain the noodles and add them back into the pot. If they have to sit for too long they might become overcooked.